Flipboard is changing the way it works with online publishers, thanks to two connected announcements. First, publishers no longer need to work directly with Flipboard in order to get their stories into the app. Instead, there’s a new self-serve signup option, allowing Flipboard to automatically pull in stories from publishers’ RSS feeds. To be clear, CEO Mike McCue said Flipboard isn’t going to let everyone into the app. Instead, there’s going to be a review process after a publisher is submitted, to ensure that they comply with Flipboard’s content rules (among other things, those rules forbid hate speech). Second, Flipboard doesn’t plan to convert all of those articles into the app’s native format. Instead, it’s going to focus on the mobile web. Flipboard already includes some non-native articles, but now it’s creating a more formal system around them, where publishers who meet certain content and advertising guidelines will get a “RED bolt” by their articles (the symbol is, in fact, a red lightning bolt, but the name also stands for Reader Enhanced Display). 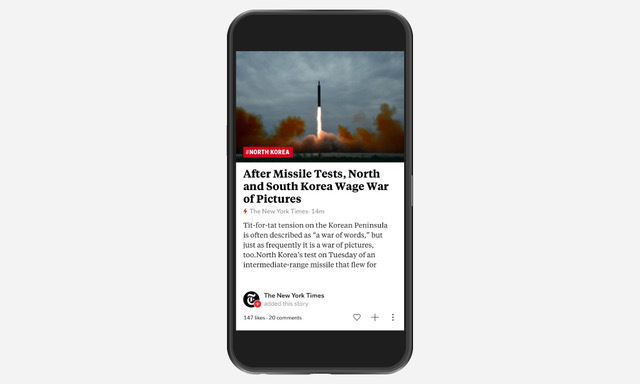 The idea, McCue said, is to “celebrate the best of the mobile web,” giving readers a clear signal about which articles will load quickly without any annoying advertising. In addition, RED bolt articles will be prioritized in Flipboard. McCue said the native article format isn’t going away entirely — but it does sound like the focus is shifting. Flipboard says there are hundreds of RED Bolt publishers on-board already, including The New York Times, The Washington Post, The Verge and Axios. Since these are the publisher’s own pages, the publishers will remain in charge of the ads. However, McCue said he’s interested in working with publishers on new types of mobile ad units in the future. As for why bringing on more publishers is important in the first place, McCue acknowledged that Flipboard isn’t suffering from a dearth of content on some subjects (like Donald Trump). However, he suggested that this will give Flipboard more depth in narrower topics (the company’s aim, after all, is to help people follow their passions, whatever those passions might be). This could also help Flipboard make inroads in countries where it doesn’t have many editorial partnerships. Those publishers will be encouraged to promote their Flipboard accounts through social plug-ins — a strategy that could help publishers get more traffic through Flipboard, and could provide a nice boost for Flipboard itself.